Lycopene may be the ultimate nutrient. The red pigment in some plants, most famously the tomato plant, helps protect you from severe, chronic disease. Let’s begin a quick three-part series with how it keeps your heart strong. Lycopene is a unique member of the carotenoid family that makes fruit and vegetables so healthy for us. In our bodies, lycopene is found in the blood, testes, adrenal glands, and prostate. It is powerful, able to withstand the effects of smoking and alcohol. 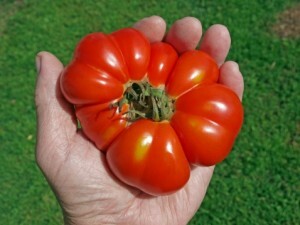 But, unfortunately, not aging: growing older reduces your lycopene levels. That helps explain the importance of eating foods rich in lycopene as the years go by. In the past 10 years, study after study has shown that tomatoes and tomato products (jammed with lycopene) could significantly reduce the risk of chronic diseases such as cancer and cardiovascular diseases. How? Because of its antioxidant powers. The nutrient may prevent clogged arteries and reduce heart attacks. Higher concentrations of lycopene in fatty tissue are linked to a lower risk of heart attacks and thick arterial walls. Also, the more lycopene in your bloodstream, the better chance you have of avoiding fatal heart disease and stroke. In a large study involving 10 European countries, samples of fat tissue from patients who suffered a heart attack proved that lycopene levels were protective against a heart attack, not the better known beta-carotene. How does it do this? A few theories include: 1) reducing cholesterol by inhibiting a particular enzyme; 2) increasing the destruction of the “bad” LDL cholesterol; and 3) its antioxidant properties. There is a “but” to all of this though. The evidence to date comes from large population and epidemiological studies, which aren’t definitive. They simply suggest that this is true. We need some quality clinical studies testing people who are at high risk of heart disease (or have it) before doctors can recommend lycopene supplements for preventing heart disease. In the meantime: more tomatoes!